The global energy landscape will evolve significantly as regional demand-and-supply patterns shift in the coming decades, creating new opportunities for international trade and economic growth. 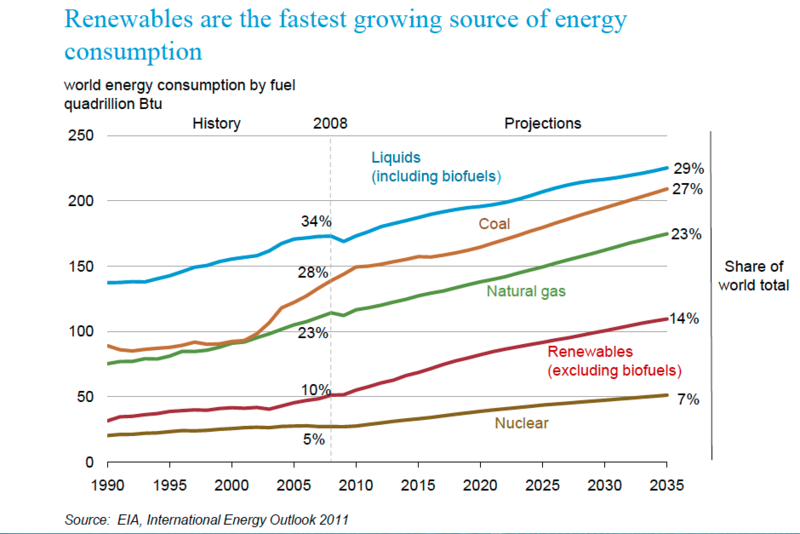 Global energy demand in 2040 will be approximately 35 percent higher than in 2010. Future energy needs will be supported by more efficient energy-saving practices and technologies, increased use of less-carbon-intensive fuels such as natural gas, nuclear and renewables, and the development of unconventional energy sources that were previously inaccessible without technology advances. Oil will continue to be the most widely used fuel, but natural gas -- the fastest growing major fuel -- is expected to overtake coal by 2025 as the second most used fuel. Demand for natural gas will increase by about 65 percent through 2040, and 20 percent of global production will occur in North America, supported by growing supplies of gas from shale and other unconventional sources. New technologies will continue to be key to development of reliable and affordable energy, which is central to economic growth and human progress, the Outlook for Energy concludes. Significant advancements in oil and natural gas technologies have safely unlocked vast new supplies, already changing the energy landscape in North America and expanding supplies to help meet growing global energy demand. The Outlook for Energy projects that North America is likely to transition to a net energy exporter by 2025. Over the next two decades, more than half of the growth in unconventional natural gas supply will be in North America, providing a strong foundation for increased economic growth across the United States, and most notably in industries such as energy, chemicals, steel and manufacturing. These resources will also create new opportunities for global trade with countries in Europe and the Asia Pacific region, which are reliant on international markets to meet domestic energy requirements. As the world gradually transitions from coal to cleaner fuels for electricity generation, natural gas, nuclear and renewable energy sources, including wind and solar, will represent a greater share of the global energy mix. Natural gas, which emits up to 60 percent less carbon dioxide than coal when used for electricity generation, will grow the most. By 2040, natural gas will account for 30 percent of global electricity generation, compared to less than 25 percent today. The Outlook for Energy highlights the important role of efficiency in helping balance energy demand with the growing world economy. Energy-saving practices and technologies, such as hybrid vehicles and high-efficiency natural gas power plants, will help countries in the Organization for Economic Cooperation and Development (OECD) increase economic output by 80 percent without increasing total energy use. In the transportation sector, the number of cars on the road worldwide is expected to approximately double by 2040, but the fuel demand will actually plateau and gradually decline as consumers turn to smaller, lighter vehicles and technologies improve fuel efficiency. • Energy demand in non-OECD countries will increase 65 percent by 2040 compared to 2010, reflecting growing prosperity in nations that include more than 80 percent of the world’s population. • Electricity generation is expected to account for more than half of the increase in global energy demand over the next few decades. Natural gas, nuclear and renewables will grow to meet rising electricity demand, while coal and oil use for power generation will decline. • Global transportation-related energy demand will rise by more than 40 percent from 2010 to 2040. The growth is almost entirely from commercial transportation -- heavy duty, aviation, marine and rail as expanding economies and international trade spur greater movement of goods. • Evolving demand and supply patterns will open the door for increased global trade opportunities. The changing energy landscape in conjunction with an abundance of free trade opportunities will help lead to more choices and creation of value that helps fuel economic growth and improve living standards worldwide.